Tired of speeding tickets from traffic police? You might need a Cheetah’s “GPSMirror”! As you may have guessed from the name, a rear-view mirror with integrated SiRFStar III GPS chipset that is extremely accurate in function which uses its built-in database to look for “accident black spots, common mobile cameras, and fixed safety camera locations” to warn you of incoming threats so you can slow down and avoid those nasty speeding tickets as well as accident too. 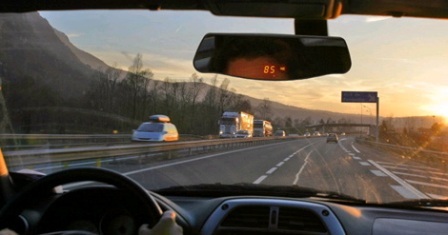 This GPS Mirror which can wirelessly integrate the alerts from popular radar detectors and laser jammers so that it will also displays your speed and gives you another warning when you are too fast or approach a hidden camera with visual, spoken tone or audible alerts, according to Cheetah. The GPS Mirror which cost for about $300 seem like value for money if you compare to the fine you’re paying for your speeding tickets.